How Does The Pituitary Gland Help? Though one of the largest endocrine glands in the body, your thyroid is actually only 18 to 60 grams! That’s from .6 to 2 ounces. It is located at the base of your neck, just under the “Adam’s Apple” and surrounds your trachea. The name thyroid comes from a Greek word meaning ‘door’ probably related to the shape of the thyroid cartilage. The wing-shaped thyroid is the balancer of your body. Its main job is to control the rate at which your body burns fuel (food), as well as a regulator for the body’s use of calcium. If your body burns food too fast, you have hyperthyroidism. If it burns it too slowly, you have hypothyroidism. Both conditions would affect how you feel and how well you function. The thyroid produces a chemical called thyroid hormone. This carries messages to the rest of the body through the bloodstream. The chemical is made from iodine and other things. If we don’t get enough iodine, it will affect the functioning of the thyroid. What decides how much thyroid hormone to produce? Answer: the tiny gland at the base of your brain called the pituitary gland. It is the size of a pea but continually monitors several systems of the body. If the pituitary senses that your blood has too little thyroid hormone, then it sends out a chemical called thyroid stimulating hormone. This signals the thyroid to produce more thyroid hormone. The thyroid hormone travels through the blood to every part of the body telling it how fast to burn the chemicals. What a marvelous design! Signs that you have hypothyroidism (underactive thyroid) include decreased energy level, fatigue, feeling cold, muscle pain, slow thinking, constipation, and weight gain. 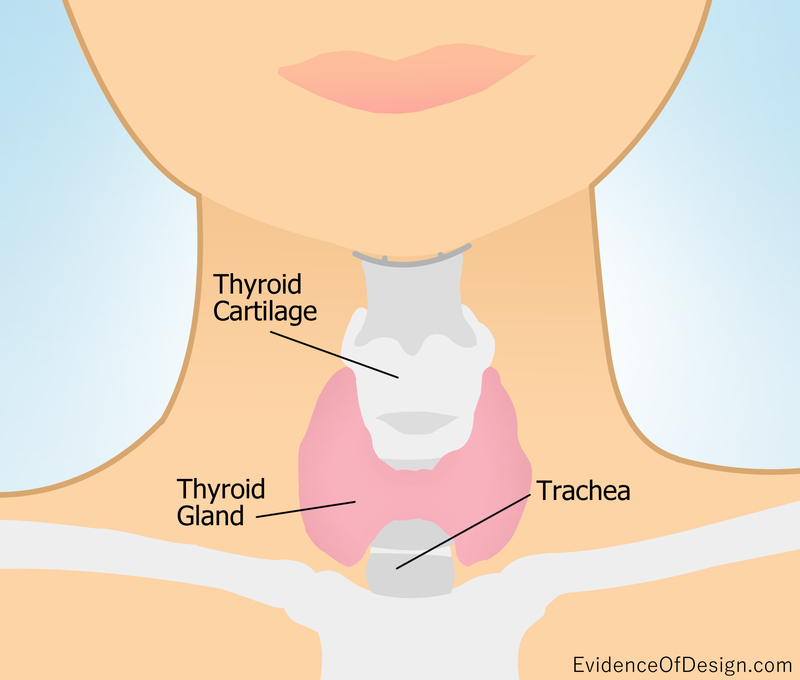 A child with an underactive thyroid may have stunted growth. Hyperthyroidism will be evident with the opposite conditions. Here is a question to evolutionists: how long did it take the thyroid to evolve after man did? The problem is, he would not function without a regulator in the body. As in a nuclear reactor, the rate of giving off energy must be kept constant or disaster results. Aren’t you glad that, in the beginning, God created Adam and Eve with thyroid glands, and He gave you one too?! And now here is a Spiritual application question: Do you help to keep the local body of Christ in balance also?